Sebastian River report, I went out yesterday and paddled the north part of the river. Hooked a small trout and some small jacks. The water was clear and the winds were light. It was a great day for sight casting along the docks. I must have seen well over 100 snook along the shore line and only had one that showed any interest in my lure. There were a lot of 5 to 8 lb. jacks swimming along the dock line that also showed no interest in my lures. That fishing. I did make my way up the north fork looking for tarpon and did not see any sign of one. It was great to see the water so clear and I hope it gives the sea grass a chance to rebound in the lagoon. Let's see how it looks after the rain. This is an interesting topic that's absolutely worth discussing. I feel it's important because the zombie tide is a tide window that few people, aside from the true doe hards, capitalize on. To begin with, the zombie tide is a late tide, incoming or outgoing depending on target species of course. How late? Well, let's just say midnight or later with my personal preference being a tidal change occurring between 2 and 4 am. This is when the pressure is off the fish and they become more active and far less spooky, thus allowing the angler to get in on the action with very little effort. For predators such as trout, snook, redfish and tarpon, the zombie tide bite is nearly always the best time to target them. Fair warning here, fish a few of this tides and you'll be hooked in a hurry. No pun intended. INSHORE: Snook fishing was pretty good this week, and should continue to improve from here on out. Look for the bridges to hold snook on the outgoing tide. Shrimp is still the main diet for the snook. The Loxahatchee River has been productive this week, with some big jacks cruising around. 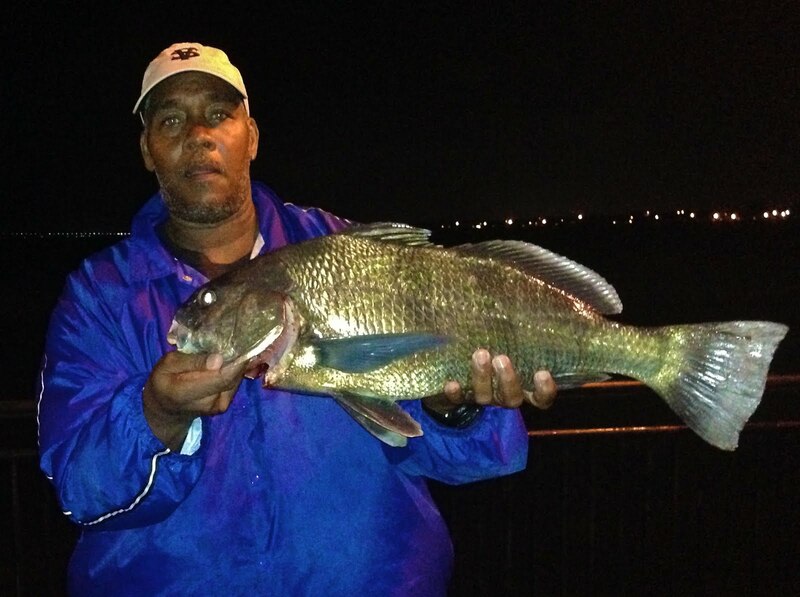 Been a few sheepshead and black drum hanging around the bridges as well. Not great fishing, but not bad fishing either! SURF/PIER: The spinner sharks are around in fair numbers, and lots of fun to catch on topwater lures. Scattered bluefish and spanish mackerel around. Pompano fishing remains a bit hit or miss. Croakers are biting well in the first trough. Hopefully the east/northeast wind in the forecast helps fire up the fish some! Though the cobia fishing has backed off this past week along the beaches in the Jensen area it’s never a bad idea to take a look if the water clarity is decent and they can be spotted. Some anglers are reporting good luck fishing for croakers. Walking the beaches using a light rod and a jig with shrimp has produced good results. The pompano fishing has been somewhat lackluster the past week along the beaches, but decent in the river. Working the ‘humps’ just outside the channel north of the Jensen Causeway has produced good results. Fishing for snook has been good around Nettles Island with one angler catching 74 fish and two slot-sized keepers. In the Jupiter area, the action along the beaches has been slow with whiting and croaker being caught near the pier on pieces of shrimp. In the Intracoastal and the Loxahatchee River there have been some jack crevalle and ladyfish being landed. In the Boynton Beach area, surf anglers have reported catching a few bonefish up to 7 pounds as well as croaker on live shrimp. Fishing for small permit along the beaches around Briny Breezes and Boynton Beach has produced good results. Bluefish have been hitting spoons early in the morning and cut mullet during the afternoon a half mile north up the beach from Boynton Inlet. Anglers have reported catching mangrove snapper, small snook and some croaker while fishing the area during outgoing tides. There have been small sharks around the channels near Daymarker # 45 just north of the inlet. Guides have reported catches of snook, small tarpon, mangrove snapper and sheepshead fishing in the canals and docks both north and south of the inlet. Lantana bridge anglers continue to catch sheepshead using crabs and sand fleas. Night anglers have been catching sand perch, ladyfish and a few bluefish using cut shrimp. On the lake the fishing has been consistent with live shiner still being the best bet for landing some nice-sized bass. We have a foggy morning at the inlet. Winds are blowing out of the West-Southwest at 5 mph, gusting to 8 and there is a moderate chop on the water and coastal showers are possible this morning. Although winds have died down, NOAA has a small craft advisory in effect through Friday morning and poor boating conditions will continue into early Saturday morning. Tommy Turowski at the Sebastian Inlet Bait and Tackle Shop reports that fishing has been decent. This morning some small Snook were landed and returned. Prevalent species include Snook, Reds, Sheepshead, Black Drum, Blues, Jacks and Spanish Mackerel. A few Pompano and a nice Permit will make an appearance occasionally. Our first two photos today feature Larry B. from Orlando. Larry landed the beautiful 37" Permit off the north jetty and landed and released the Black tip Shark off the south beach. Photo three is of Rosezana with the 17" Black Drum, photo four is of Kenneth giving a Silver Jenny a kiss goodbye! Photo five is of Rosezana with a real pretty Sheepshead. It's Seaguar Red Label product. It's in that packaging to try gain market share up north (which worked). They offer it in 100yds at a low price because a lot of people in that fishery buy fluoro mainline and use it as leader cause it's cheaper, ex. 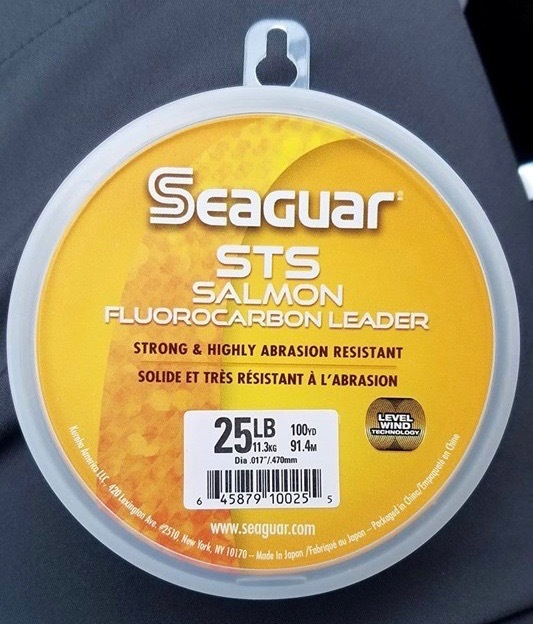 Yo-Zuri TopKnot Fluorocarbon mainline is $14.99 for 200yds. We have a lovely morning at the Sebastian Inlet. Winds are barley moving out of the West, gusting to 2 and there is a moderate chop on the water. A low pressure system that is moving across the state will cause boating conditions to start deteriorating mid-week. The weekend bite was good according to Tommy Turowski at the Sebastian Inlet Bait and Tackle Shop. Tommy reported that Sheepshead, Snook, Reds, Black Drum, Jacks, Pompano and Spanish Mackerel were all hitting over the weekend. Our angler of the days is Vic D. of Orlando. Vic landed the huge C/R Red using a speckled crab he caught in the surf. This big bull was over 50" and he landed a second big Red within 5 minutes of releasing this one. The FWC will be hosting the 6th Annual Women's Fishing Clinic on Saturday, March 18th from 9:00 -5:00 at the Sebastian Inlet State Park. 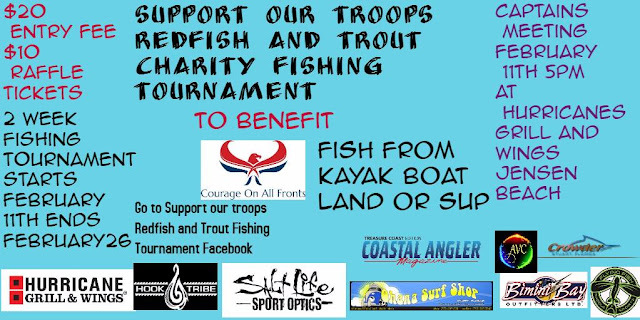 The event is open to ladies 18 and over who have a valid recreational saltwater fishing license, unless exempt. Fishing equipment is loaned during the event but you may bring your own gear. All participants must pre-register by contacting Heather Sneed at 850-487-0554 or Heather.Sneed@MyFWC.com. The clinic is a catch and release only event. We have a beautiful morning at the inlet. It's a little cooler, but gorgeous. Winds are blowing out of the West-Southwest at 9 mph, gusting to 11 and there is a light chop on the water. NOAA has a small craft advisory through 10:00 a.m. this morning. 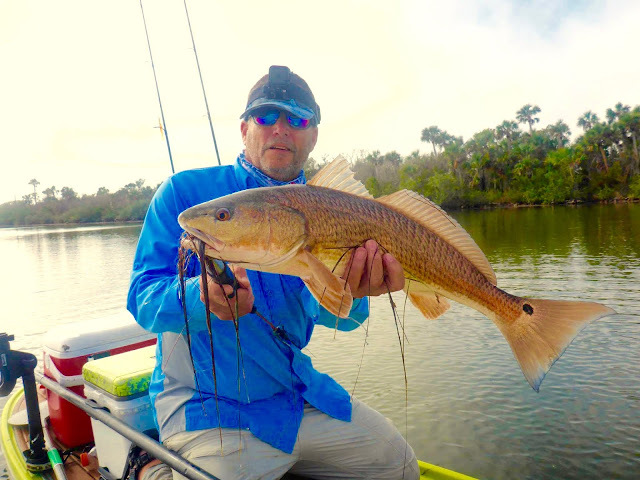 Big Reds are active, along with slot and oversized Snook. 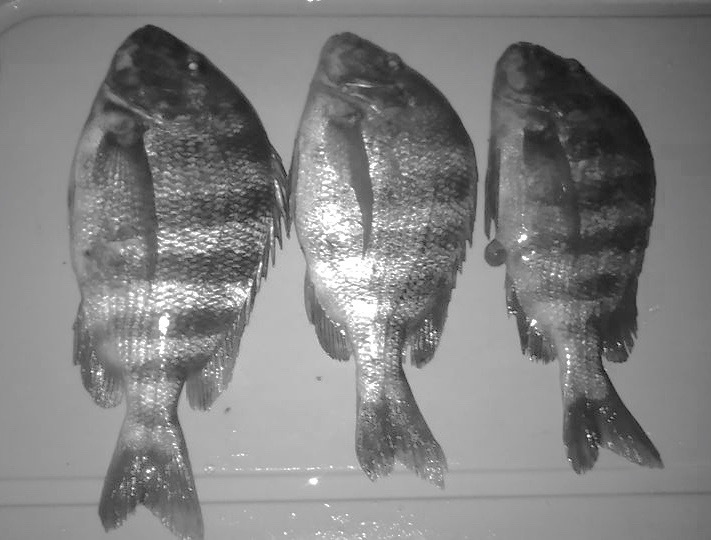 Sheepshead are hitting crustaceans around structures. A few Spanish Mackerel, Black Drum, Pompano, Flounder and Blues are biting sporadically, it's just a matter of timing. Get out and try your luck on this beautiful day! Our first photo today is courtesy of Shaun Vasey of Palm Bay. Shaun landed this huge Red using a popper on the north side. Shaun reported that Reds are out in force right now and anyone looking for spectacular top water action now is the time to get out there! The next three photos are courtesy of Luke Vila of Kissimmee. Luke and his friend Eduardo Francheski fished the west mangroves early morning and reported the bite was steady. They landed a huge number of Sheepshead and a couple of Black Drum. All fish were released. The people fishing beside them had similar luck and Luke added a photo of one of them as well. 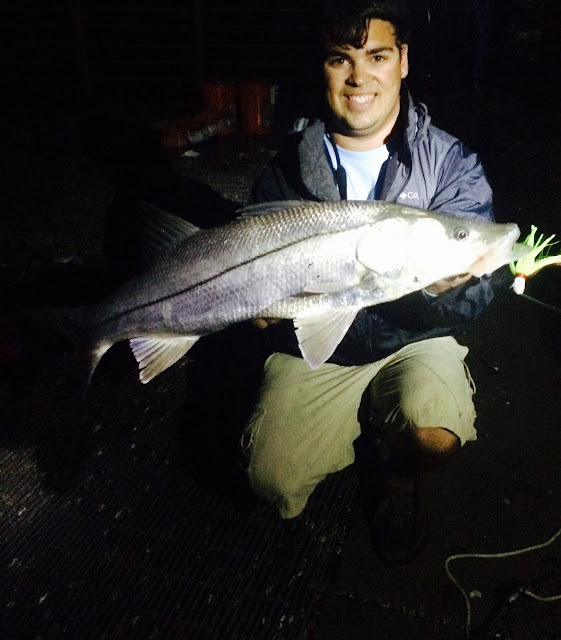 Photo two is of Eduardo Francheski of Kissimmee with nice Black Drum that was released. Nice one Ed! Photo three features Luke with a Sheepshead and photo four is of Tony with a good sized Sheepshead. Sebastian Fishing report. Big schools of black drum can be found along the beach. At times cast to them from shore but the best way is to use a boat or kayak and go along the shore line to find them.The drum can run over 70 lbs. When the seas are calm you will find a lot of snapper on the reefs 15 to 20 miles out of the inlet. At the inlet you will find pompano on the inside and over slot snook and reds on the outside. In the lagoon you will find trout in the deeper water cuts and passes and the water has cleared to the point that you can sight cast to redfish and snook along the mangroves. In spots of the lagoon you can see 6 foot to the bottom but not much in sea grass can be found. Hope it stays clear for the next few months and the sea grass has a chance to make a comeback. 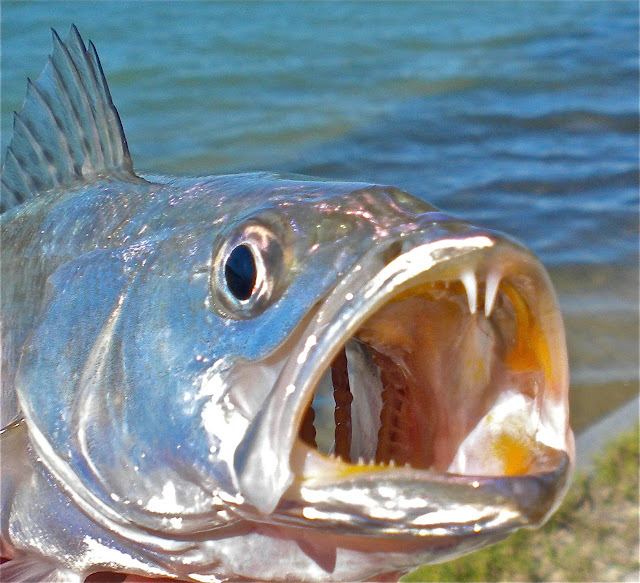 INSHORE: Snook fishing remains pretty good. The bridges will continue to produce best at night, especially on an outgoing tide. Shrimp remains the bait of choice for the snook, but throwing a jig or large swim bait could also excite a strike from a lurking slob. Overall the snook are not terribly aggressive this time of year, so try and keep your presentation on the slower side for best results. The flats around JD MaCarthur State Park continue to produce mixed bag action. Some snook, trout, sheepshead, ladyfish, and jacks around the flats to keep things interesting. 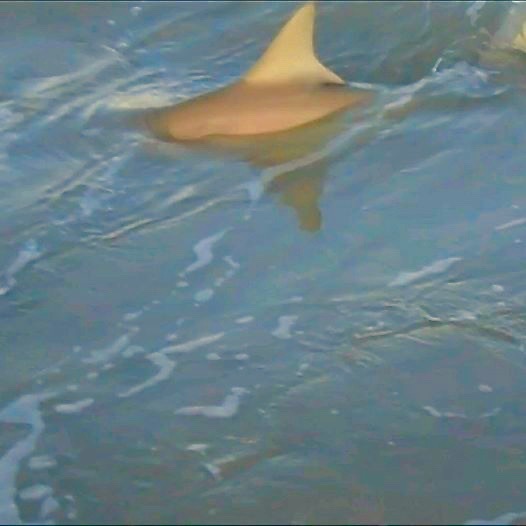 SURF/PIER: The big news this week was the arrival of a good number of blacktop and spinner sharks from Jupiter to Singer Island. 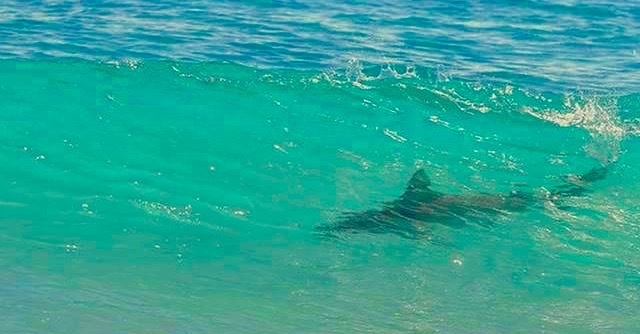 The sharks have been a bit spooky, so target them in lowlight conditions for best results. Large topwater plugs, large swimming plugs, or fresh cut bait is a good way to go for the sharks. Pompano fishing has been spotty. Spanish mackerel and bluefish remain scattered up and down the line. 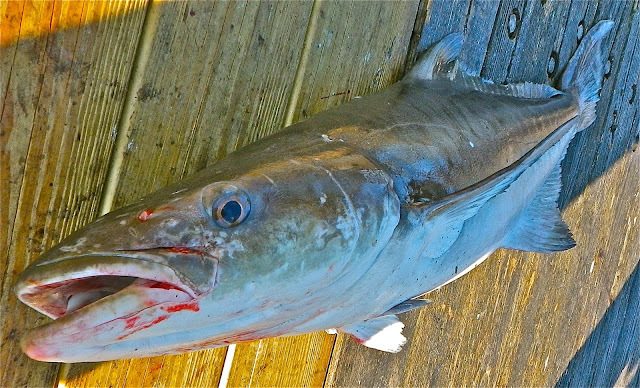 Along the beaches in Jensen the cooler weather has helped the cobia action. Jigs and live baits are the key. One angler took a 30 pounder last week. The croaker and whiting fishing has been excellent. The best luck is being had using sandflea-flavored fishbites mixed with live bait. The pompano fishing along the beach has been good, but timing is crucial. With the mid-morning high tide the past week there’s been only about a one-hour window. Just inside the inlet and along the docks near the House of Refuge the pompano fishing has been fairly consistent. 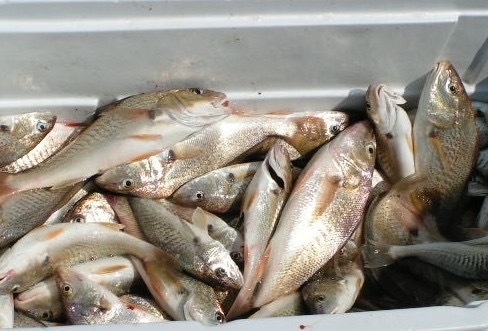 In the Jupiter area, the croaker and whiting fishing has been good at the Juno Pier using fresh cut shrimp. The area beaches have been hit or miss for pompano. North of the Jupiter Inlet the bluefish action has been decent with fish up to eight pounds being taken. 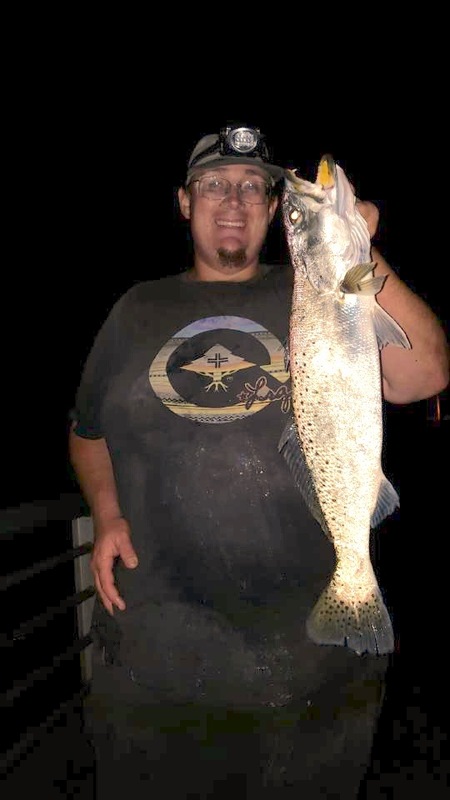 Fishing for jacks and Spanish mackerel has been good in the area as well. 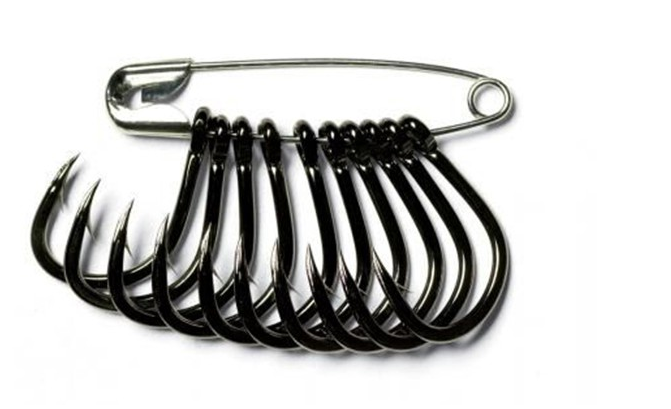 Anglers using spoons are having the best luck. In the Loxahatchee River the fishing for bluefish and jacks has been good, but with decent weather offshore there hasn’t been many takers because most fisherman are preferring to head out on the ocean. The snook fishing both in the Jensen Beach and Jupiter areas has been slow, but will begin picking up as spring approaches. In the south county area, there has been an uptick in the cobia action. Anglers should look for sting rays as cobia will often be in the vicinity and use jigs and bounce them off the bottom. The beaches from Lantana south to Red Reef Park in Boca Raton have been producing good results for bluefish and pompano. Fishing in the mornings, using Goofy Jigs and Got-Cha lures has been the key. The school of large tarpon off of the Boynton Inlet is still MIA, but several large individuals, some around 100 pounds, are still being seen in the area. Off of the jetty at the inlet some mangrove snapper and snook are being caught, but mostly at night. The Lantana Bridge is been a good spot for sand perch, sheepshead and occasional sea trout. The sand perch and sea trout are being caught on live shrimp and the sheepshead on clam strips and oysters. 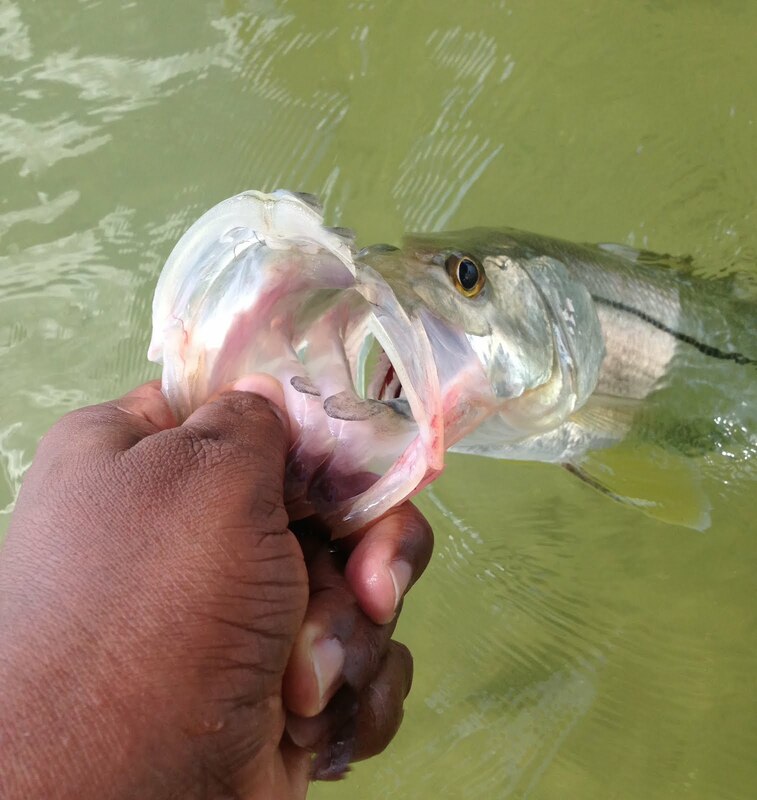 Recently the bass fishing has been really good on shiners and is starting to pick up a little on artificial lures. Fishing the outside edge is still best if possible with wind. With a consistent swell keeping the water churned up just enough, the fishing for pompano has been outstanding along the beaches in the Jensen area. Anglers are having good luck using clams and Fishbites. Whiting and some bluefish are also being caught along the beaches in the area especially near Normandy and Herman’s Bay beaches. Around the St. Lucie Inlet and just inside along the MacArthur Boulevard docks, the action has been good for flounder, sheepshead, snapper and small snook. Shrimp has been the call. In the river the snook bite has been decent with the best luck being found near the Roosevelt Bridge using big swim baits being worked along the bottom. With the nice weather recently, many anglers in the Jupiter area have been heading out on the open ocean rather than stay inside. That said, the action has been OK and snook fisherman, keeping an eye out for schools of bait passing through, can find some keepers around area bridges. From Boynton Beach Inlet north to the Lake Worth Pier bluefish, undersized king mackerel, whiting and small permit have been hitting along the beach. Inlet anglers have reported mangrove snappers up to four pounds, bluefish and permit to 15 pounds hitting at night during the outgoing tide. The school of large tarpon that had been hanging around the mouth of the inlet last week seems to have gone missing in action. Several kayak anglers had fantastic luck with sheepshead and a few flounder this past weekend fishing around the docks in Manalapan using live shrimp and small crabs around the pilings. 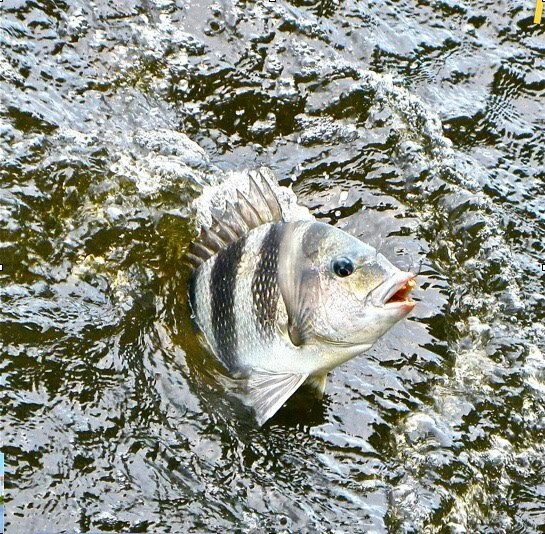 Perch, small black drum, sheepshead, small mangrove snapper and a few pompano have been caught by anglers fishing both live or cut shrimp around the Lantana Bridge. The artificial bite still has slowed down, but the shiner bite has been outstanding. Tonight’s full moon should produce some good action and there are lots of bass moving through. We have a real nice morning at the inlet. Winds are blowing out of the East-Southeast at 2 mph, gusting to 4 and there is a moderate chop on the water. There are no NOAA advisories this morning. The bite slowed down a little, we're seeing mainly Snook and Sheepshead from the jetties. Corey Williams reported that huge Black Drum schools are running along the beach from Cape Canaveral to Sebastian. He landed and released some real dinosaurs while fishing from a boat. Thanks Corey! 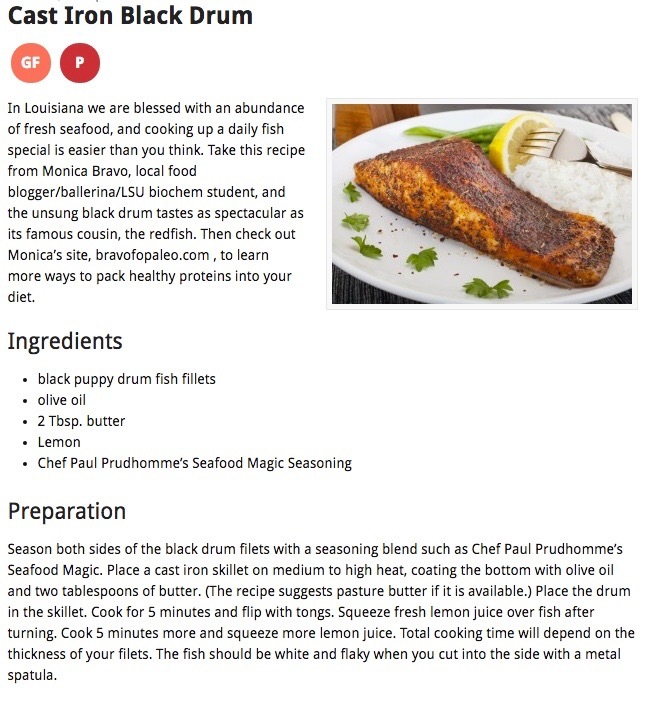 Please remember the bag limit for Black Drum is five per person per day with a 14" - 24" slot. An angler may possess one over 24". By the time they get real big, it's best to release the big breeders; they can be very tough and often wormy. Our three photos are courtesy of Sarah at the Sebastian Inlet Bait and Tackle Shop. Sarah took the photos last Tuesday when she walked out to the north jetty. Photo two features Robin with a C/R Snook. Photo two features Robert who was here from Vermont. Robert landed the oversized Red while fishing from the shore of the north jetty on the outgoing tide. The Red was released right after the photo. 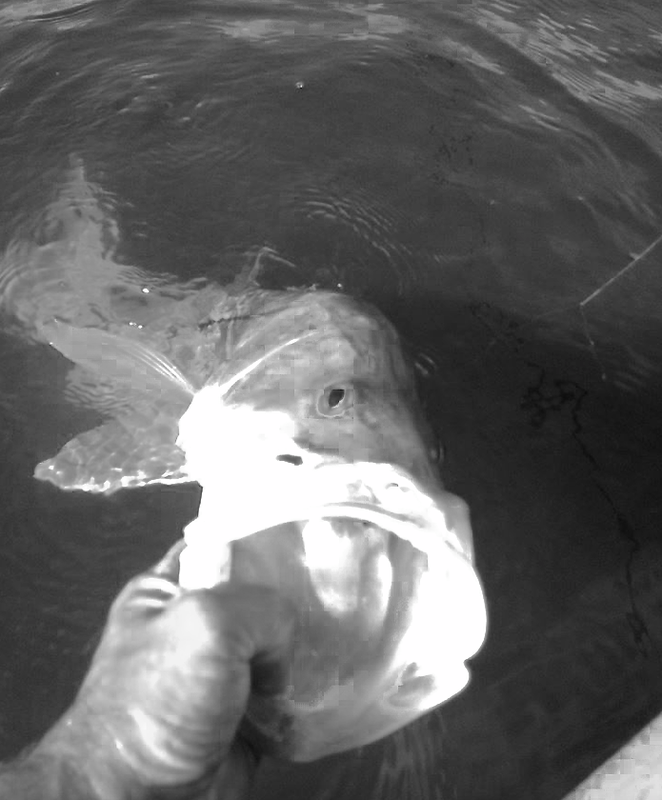 Photo three is of Hugo with a 33" C/R Snook that was returned to the water. Park Info: The Sebastian Inlet State Park has a couple of fun events planned this week. Saturday from 1:00 - 3:15 p.m. a Surf Fishing Workshop will be held at the Fishing Museum on the south side of the Park. Discussions center on the equipment needed to enjoy a productive surf fishing day at the beach. Topics include rod and reel selection, standard pompano rig, choosing bait and more. 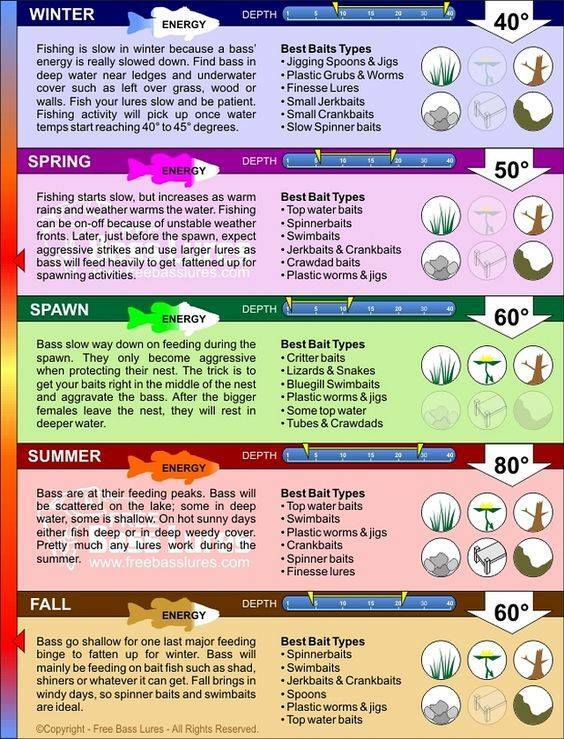 Anglers should bring a pen or pencil and something to write on. The snapper bite has been good around the channel ledges with live shrimp and white baits with some nice mangroves the pompano bite has been ok in the inlet with a few flounder mixed in. The jetty at night has been ok with a few snook around on live bait and jigs the water has been super clear so the bite has been tough this front coming later this week with a northeast wind should get them biting good.